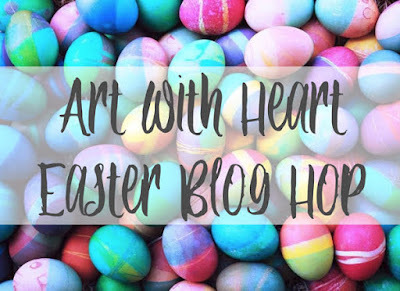 Hi everyone, welcome to the Art with Heart Easter blog hop. Tonight, the team are sharing creative projects with an Easter theme. 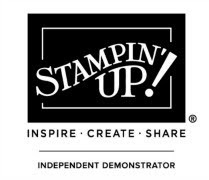 *Just a reminder that Sale-a-bration ends on March 31st, but there's still time to earn FREE products with a $90 minimum purchase or by joining our fabulous Stampin' Up! team. Ask any of the girls on the hop for more details. Tonight I'm sharing a card and Easter gift box. Let's start with the card. My favourite card to make is a 4 1/8" square card and tonight is no exception. 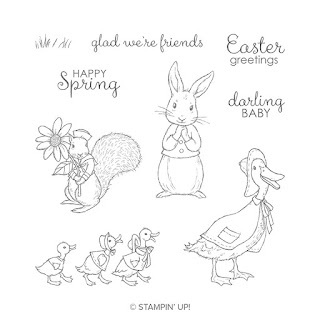 The Fable Friends stamp set from the Occasions Catalogue has proven to be VERY popular, especially the bunny, and so it was an easy choice for the central image on my Easter card. The sentiments is also from the set. I masked off and stamped these two words separately. 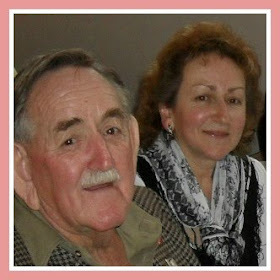 I used the 'easter' from Easter Greetings and the 'happy' from Happy Spring. It's very easy to mask off what you don't want stamped. 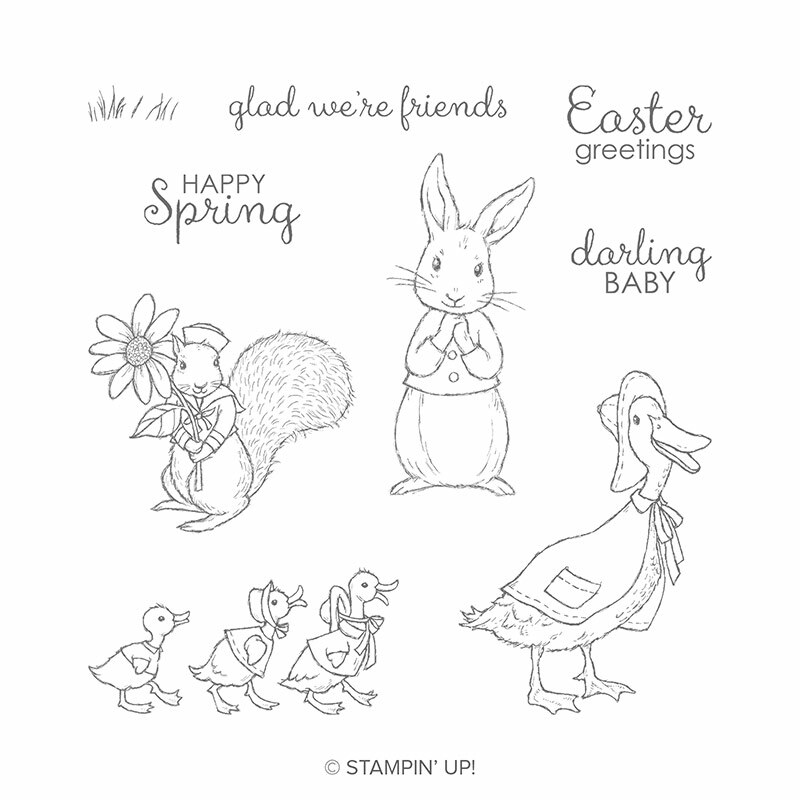 The bunny and sentiments are stamped in Memento black ink. 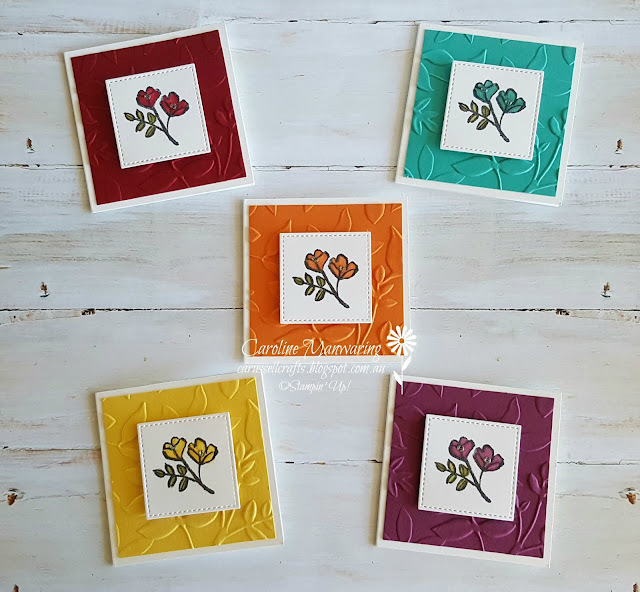 The line art images make them so easy to colour in with the Stampin' Blends, not to mention FUN! The colours I used were, Balmy Blue - Light & Dark, Crumb Cake - Light & Dark, and Petal Pink - Dark, for the inside of his ears. I stamped the bunny twice and fussy cut one of them out to use as a mask. I held this one in place over the other one so that I could sponge the background in Balmy Blue ink and add the grass, using Lemon Lime Twist. I used a blender pen to add some ink straight from my LLT ink pad and then stamped more grass with the grass stamp. I die-cut the bunny with a stitched oval and stuck this onto a scalloped oval in Whisper White. 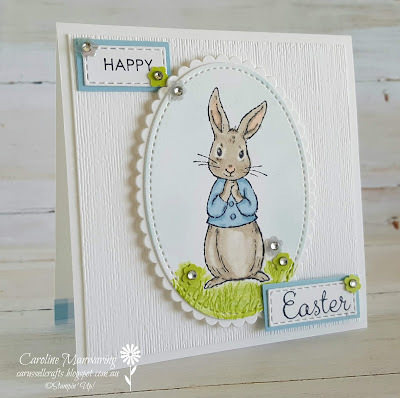 I used dimensionals to attach the oval to a Subtle embossed panel, and each of the sentiments were die-cut with a stitched rectangle and backed with a piece of Balmy Blue cardstock. The little flowers are the Gingham Gala sequins, and I added a clear rhinestone to the centres' of them. Thanks to our tiny Treat Boxes, it was really simple to put this little gift box together. I used a piece of the Balmy Blue Gingham Gala 6" x 6" DSP to basically make a little tray to sit the acetate box in. Some glue dots hold this in place. I die-cut stitched squares from both the DSP and Balmy Blue cardstock for the top of the box. A length of Balmy Blue organdy ribbon, (a Sale-a-bration freebie! ), was threaded through a punched hole in the top to form a loop, and the ends were split apart, like you would a split pin, and taped in place. Then I covered this with another stitched square to hide the ends. By adding the ribbon this way, you don't end up with knot-tied ends showing. 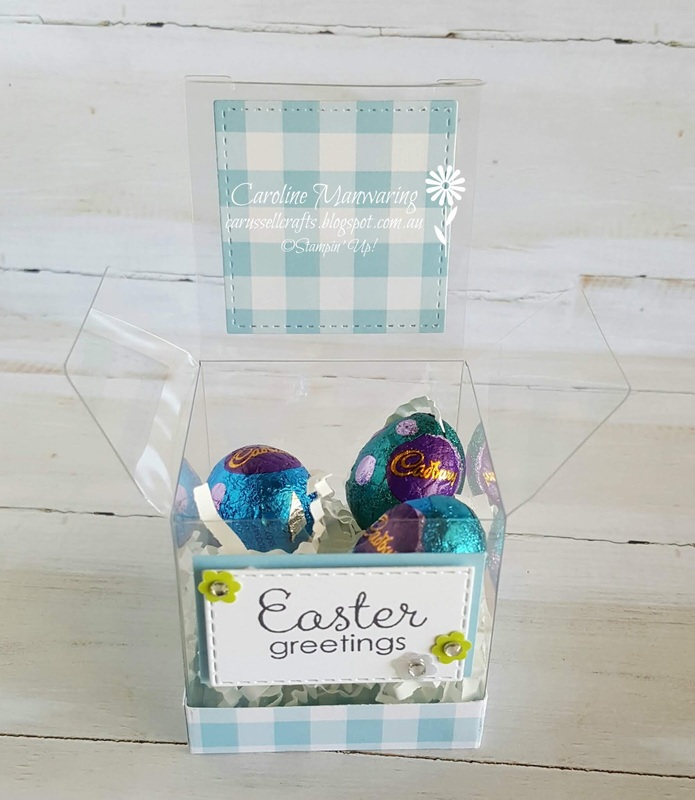 I was hoping to add a little chocolate bunny inside the box, but can you believe it, I couldn't find one! I guess these chocolate eggs will have to do. Thanks for joining us on our hop tonight, now it's time to head over to the blog of our next team member, the lovely and talented Sue Madex. If you find a broken link or have come to this blog hop from a different entry point, below is the list of tonight's participants. If you are leaving a comment below, thank you so much. 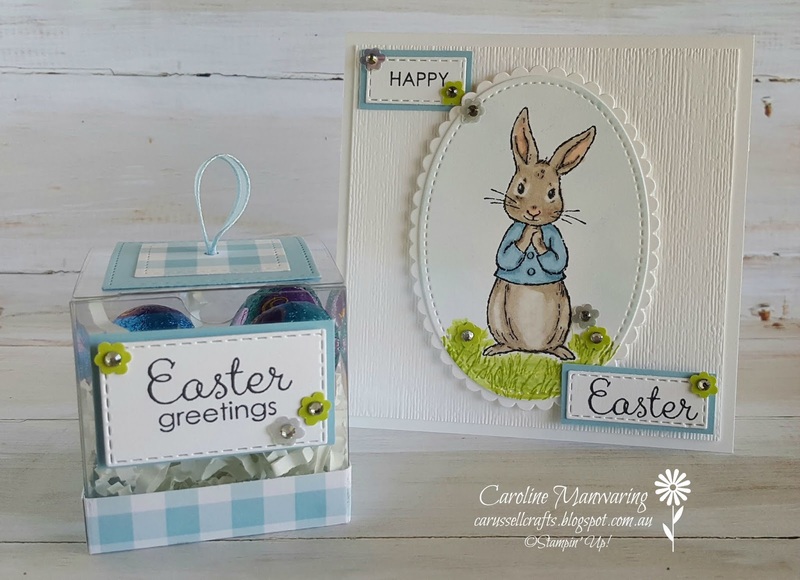 Adorable projects Caroline, I love your colouring of the bunny and the decorated acetate box, yum! So cute and adorable Caroline! Your colouring is fabulous! 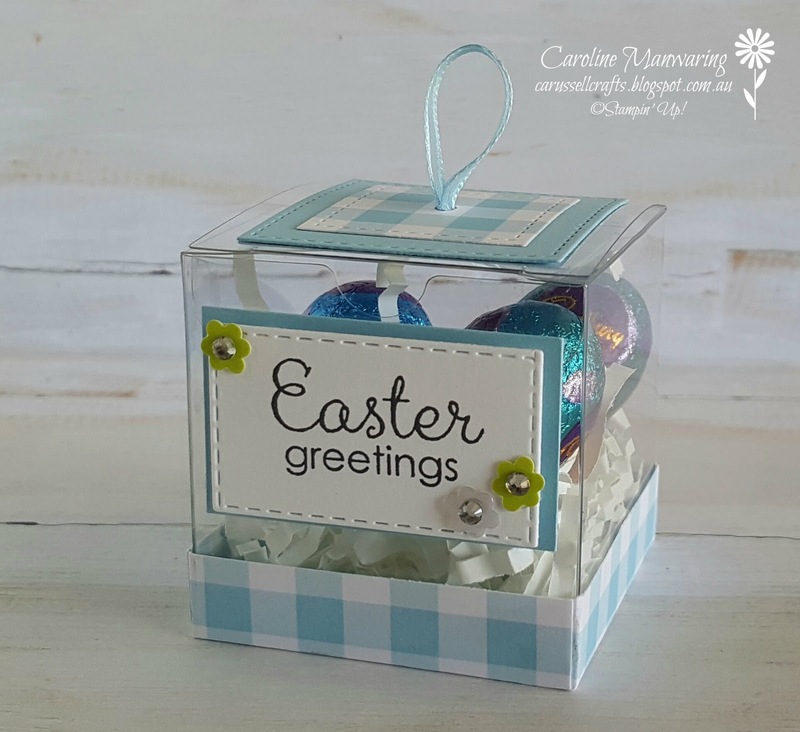 Gorgeous Caroline, I love the acetate box, great idea! Beautiful gift set, Caroline. Isn't that bunny just adorable! Such a fabulous idea with the Tiny Treat boxes. Love your bunny card Caroline and the treat box they go so well together. So pretty with the scalloped detail and the embossing folder. Love the box too. oh my, so sweet! 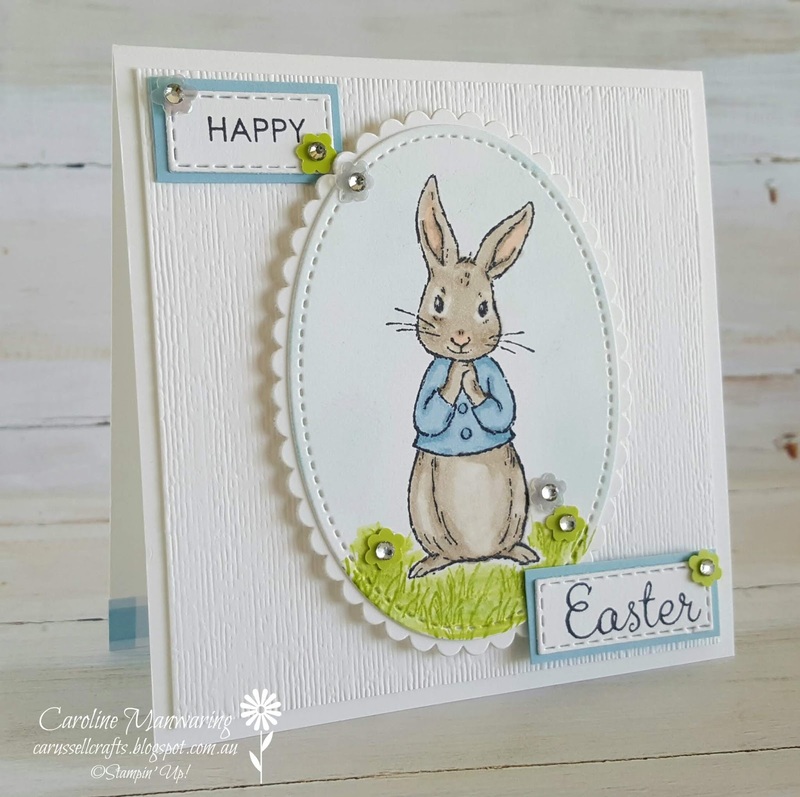 Your card is gorgeous, the bunny looks fabulous on the white background. And that gingham gift box! Super sweet!